The Goa Carnival, Food & Cultural Festival 2013, a grand celebration of its rich culture and heritage, will take place from 8th to 12th of February, 2013. Designed to get people to 'Come together' for several days of music, dancing and other activities, this public party and float parade is expected to draw tourists from the country and all over the world. In recognition of Goa's diverse population including its vast tourist populace, the event promotes a message of tolerance, friendship and inclusiveness. The Opening Ceremony will kick off at D.B. Marg, Panaji on the 9th of February, 2013. However, for the very first time, the Carnival experience will include the Food & Cultural Festival which is envisaged over a period of 5 days, from the 8th to the 12th of February 2013 at the NIWS Grounds, Caranzalem, Panaji. It will offer visitors the opportunity to experience cuisine and culture in a positive way, through a unique blend of food, fun, local and national live music performances, fashion shows, and entertainment. 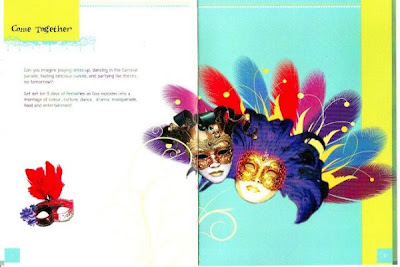 The event management agency entrusted with the responsibilities for conducting the 5- day fiesta of fun, food and frolic is M/s Vinsan Graphics, an agency based in Goa with branches in Mumbai and Delhi. Commenting on the Goa Carnaval, Food & Cultural Festival, a spokesperson from Goa Tourism said, "We strongly urge people to join the festivities and come out in large numbers to participate. We are reviving the yesteryears fervor of the Carnaval with larger-than-life decor, mask installations and a Food &. Cultural Festival — the biggest of its kind in Goa."